On 16th July (Saturday) the Electoral Action of Poles in Lithuania – Christian Families Alliance (AWPL-ZChR) and the Vilnius District Branch of the Association of Poles in Lithuania (ZPL) invited their members and sympathisers along with their families to the Family Tourist Gathering for the sixteenth time already. The two-day family picnic is taking place traditionally in the Sužionys eldership (Vilnius region) by the Lake Asveja in Bieliškės from 16th to 17th July. “Przybyli ułani pod okienko” – girls from Vilnius, the participants of the 16th AWPL-ZChr-ZPL Family Gathering, welcomed with this song the people who arrived at the gathering of Polish cavalrymen of the Uhlans Regiment at the Horse Riding Club “Joker” in Chełmno, the 13th Vilnius Cavalry Regiment Volunteer Cavalry Squadron Kielce Foundation, and the J. Piłsudski Uhlans Squadron in Cracow. The participation in the gathering is the last event on the agenda of the 4th Uhlans Rally, which has been taking place in the Vilnius region since the beginning of this week. The uhlans were brought into the gathering by Łukasz Madej of the Regiment “Joker”. Valdemar Tomaševski, the AWPL-ZChR leader and chairman of the ZPL Vilnius District Branch, welcomed the party members and sympathisers with their families, all the participants of the gathering, including the honourable guests: Deputy Marshal of the Polish Senate Maria Koc, Senator Czesław Ryszka, Ambassador of Poland in Lithuania Jarosław Czubiński, a delegation from the Association “Polish Community” headed by its chairman, Longin Komołowski. The head of the Polish diplomatic mission in Lithuania, Jarosław Czubiński, focused in his speech on what family means nowadays. “The family strength consists in a lasting relationship, and the strength of Polishness consists in unity. Let’s pray every day, but also work hard, so that we’re able to maintain this unity and use it when it’s needed,” said the ambassador. Deputy Marshal of the Polish Senate Maria Koc thanked for the invitation and possibility of being together with her countrymen in Lithuania. “You can always count on support from the Polish Senate,” assured the vice-head. “For the Polish Senate you’re the highest value,” declared M. Koc. She thanked the Poles that they stayed together and cultivated Polishness, taught Polish to children, that they took so much care of the Polish schools. “It’s absolutely essential,” she assessed. She said also that the Poles in Lithuania were extremely active in any field and very successful. “We see those successes and are very proud of them,” she said. The Deputy Marshal of the Polish Senate expressed hope that the AWPL-ZChR will succeed in introducing even more representatives into the parliament after the election. Czesław Ryszka also focused in his speech on the topic of the role and meaning of the family. “Poland is the last country in which the traditional family is protected. Also life is protected – from conception to natural death,” he said and expressed his wishes saying he hoped the Poles in Lithuania would constitute a bastion of family defence. 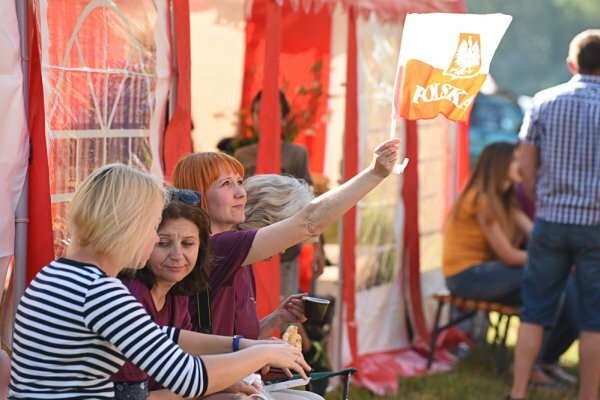 Chairman of “Polish Community” Longin Komołowski, who is taking part in the family picnic of the AWPL-ZChR for the sixth time, said that the Poles in Lithuania cultivated Polishness being a community, and so the process of denationalisation would not affect them. “The Vilnius region is absolutely different from the Polish communities all over the world. There is not such an organised group as here anywhere,” Komołowski pointed out the uniqueness of the Polish community. “You’re a role model for the Polish communities all over the world,” he stated. “Above this little Poland you form here clouds have been gathering for years. These clouds are various law changes, the Lithuanian community’s actions, which would like to constrain this little mother country,” he said, mentioning, among others, the attempts to impinge on the Polish education in Lithuania, attempts to limit the Poles’ participation in elections. Valdemar Tomaševski, as he has said, is a true leader. “Support your leaders, because it’s thanks to them that the Polishness in Lithuania still lasts,” he urged and appealed to the election participants to run for the parliament with the belief that they will win. As part of tradition already, at the opening ceremony the “Sużanianka” ensemble under the direction of Margarita Krzyżewska sang for the participants of the Gathering. Valdemar Tomaševski invited the chairmen of the party branches Marija Rekst, Zdzislav Palevič, Maria Pucz, Rita Tamašunienė, Zbigniew Jedziński, and Wanda Krawczonok, who, along with Deputy Marshal of the Polish Senate Maria Koc, raised the party’s flag, thus officially opening the family picnic. After the official opening of the gathering, uhlans from as many as three regiments arrived from Poland for its participants. The Polish cavalrymen presented a programme, which included a parade, cavalry attack performance, and demonstration of swordsmanship. On Saturday various games and sports competitions, a contest for the title of the nicest farm, and a contest of knowledge about the Vilnius region are taking place, and in the evening all the participants will be invited for the artistic programme with fireworks. On Sunday a fishing competition will be taking place. The gathering participants will take part in the mass at the church in Sužionys. In the afternoon, in turn, the winners of particular contests will be honoured.